The 21st century is poised for a renaissance in one of the world’s oldest building materials — wood. With innovations seen in products, engineering, design tools, manufacturing and environmental aspirations, the use of wood is on the rise in taller, bigger and higher performing buildings. Please join us on May 12th for this special presentation at the High Commission of Canada. This will bring together two Canadian experts to talk about the surge in both interest and capabilities in wood design being seen across Canada. This surge is part of the increasing global interest in using the only major structural material grown by the sun. Sukh Johal, from the Canadian Wood Council and Wood WORKS! 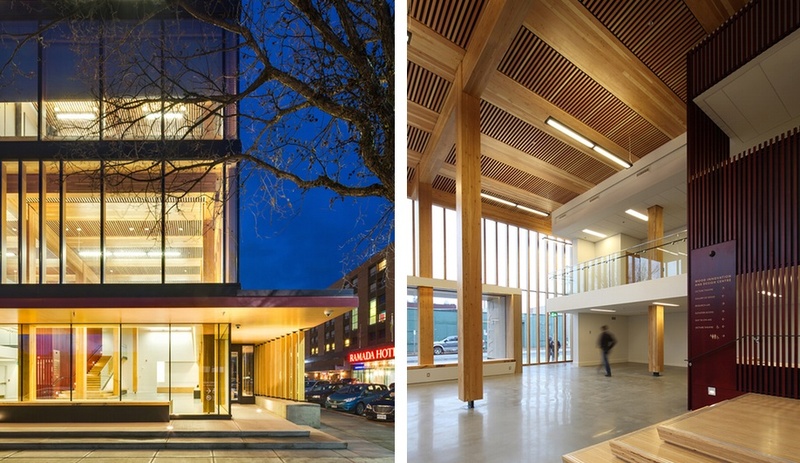 BC, is the Technical Director for Mid-Rise and tall wood buildings in Canada and has been instrumental in working with architects, engineers, contractors and building officials to enable greater use of wood in taller buildings. Peter Moonen is the National Sustainability Director for the Canadian Wood Council and has worked with design teams, manufacturers and policy makers to understand better the contribution wood construction can make to our environmental efforts. Andrew Waugh is a founding Director of London-based Waugh Thistleton. He is passionate about architecture and the built environment outside as well as within the practice. Andrew has a keen understanding of property development, which allows him an insight into the mechanisms behind building procurement and is well respected in both the public sector and by private developers. Please register here – please note places are extremely llimited. This presentation will take place at historic Canada House. Reopened by HM the Queen and the Duke of Edinburgh on February 29th, the revitalization of Canada has renewed this 200-year-old Grade II listed landmark building on Trafalgar Square. Wood plays an important part of this renewal and appears throughout the building in flooring, panelling and the fixtures and furniture of both the public and private spaces. This project also connected Canada House to the adjacent building at 2-4 Cockspur Street. As a result, for the first time in fifty years, the Canadian Government offices in London under one room, and in one of the World’s most iconic squares.